During sweltering New York City summers, the local power utility warns that for every degree you lower the thermostat, your energy bill goes up by 6 percent. 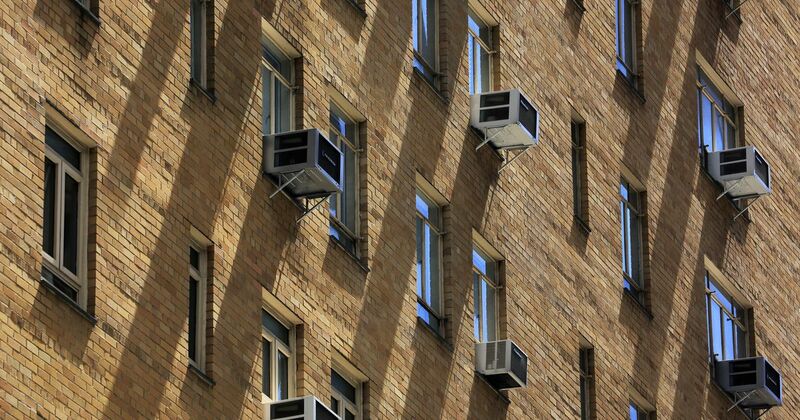 Air conditioners in every form — from window units to central air — gulp energy. There are some 1.6 billion A.C. units worldwide, accounting for around 10 percent of the world’s electricity consumption. And a new report from the International Energy Agency predicts that over the course of the next 30 years, this number will triple globally, to 5.6 billion buzzing, cooling appliances. The looming surge in air conditioning can’t be stopped, as billions more people in improving economic circumstances will want to purchase the units. Plus, they’ll have increased motivation to use them. “We know we can expect heating over the next decades, and this will require billions of people who will need access to livable conditions,” Jeff Deyette, the director of state policy and energy analysis for the Union of Concerned Scientists, said in an interview. Deyette had no involvement with the report. As the potent heat-trapping gas carbon dioxide continues to accumulate in Earth’s atmosphere, emitted by human industry and activity, scientists expect that the Earth will continue to warm. Seventeen of the last 18 years have been the warmest on record. The agency hopes that the 92-page report will not discourage the use of air conditioners — everyone has the right to use one — but will emphasize the need to make them more efficient. Today, air conditioners in Japan and Europe are about 25 percent more efficient than those sold in the U.S. and China, the report says. Plus, many people aren’t buying the most energy efficient air conditioners available, according to the report. Although many nations are transitioning to renewable energy like solar and wind, globally, cities will largely still run on coal and natural gas to meet a surging energy demand. China, for example, plans to build 700 coal-powered plants around the world, many of which are being constructed for developing countries in need of energy. But if there’s a global standard requiring the appliances to be more efficient, the total energy usage of these appliances could be slashed by close to 50 percent, argue the report’s authors. This plan, which the report calls the “Efficient Cooling Scenario,” would require a global mandate, similar to the Paris Climate Agreement or the more recent plans to dramatically clean up the shipping sector. Requiring that wasteful appliances like refrigerators be more efficient has had considerable societal effect in the past. Michael Picker, the president of the California Public Utilities Commission, called the state’s 1970s-era standards on appliances “brilliant.” Picker credited these standards for keeping the state’s energy demand “flat,” while the rest of the nation’s demand doubled. By 2050, however, California expects that it will be powered almost entirely on renewable energies, and in two years, half of the state’s energy usage may come from renewables. The primary need is getting efficient AC units into places that don’t already have them, and that may run mostly on fossil fuel-generated energy. Many of these areas, it appears, happen to be some of the hottest on Earth. “Most homes in hot countries have not yet purchased their first AC,” the report says. In India, where an asphalt crosswalk melted during a May 2016 heatwave, only 5 percent of households currently have AC units, something that will soon change. Newer, more energy-efficient AC units may be more expensive than antiquated models, which could discourage emerging countries from committing to such a standard. But this shouldn’t be a deal-breaker, said Deyette. “This really comes down to affordability. The more that’s invested in efficient units, the less expensive they become — it’s as simple as economies of scale,” he said.